Eyelid surgery, (also called and eye lift or blepharoplasty), are surgical procedures that are performed to improve the appearance of the eyelids. Surgery can be performed to reduce bagginess from lower eyelids or remove excess skin from the upper eyelids. This surgery is usually done for cosmetic reasons but it’s also an effective way to improve sight in older people. Sagging upper eyelids can get in the way of their vision. Loose or sagging skin that creates folds, and disturbs the natural contour of the upper eyelid, sometimes impairing vision. Excess fatty deposits that can appear as puffiness in the eyelids. Excess skin and fine wrinkles in the lower eyelid. Eyelid surgery (also known as blepharoplasty), is a surgical procedure for those wanting to improve the look (and function) of their eyelids. It’s designed to treat those with loose or sagging skin that is either unappealing and/or disturbs the natural function of the eyelid (impairing vision). There are other reasons one might consider eyelid surgery like bags under the eyes, excess skin and wrinkles of the lower eyelid, etc. If you think eyelid surgery might be helpful for you, schedule a consultation with Dr. Griner to discuss your options and understand better the possibilities. Depending on what you are having done, eyelid surgery may be performed in an office-based surgical facility, outpatient ambulatory surgical center, or a hospital. If you have excess, hanging skin obscuring the natural fold of the upper eyelids or loose skin hanging down over the eyelashes, you might consider eyelid surgery. The excess skin can be removed in a way that hides the scar within the natural fold of the upper eyelid or just below the lower lashes. Droopy eyelids are common and frustrating for many people. With cosmetic eyelid surgery can remove and tighten excess eyelid skin for a more alert, youthful look. Schedule a consultation with Dr. Griner today to discuss how it might help you. Technically known as blepharoplasty, eyelid surgery is a surgical procedure done to remove any excess fat, skin, and loose muscle from the upper and lower eyelids. Blepharoplasty uses incisions to remove the skin or fat. The skin is then bound together using a thin stitch to allow for a creation of an eyelid crease. Will an eyelid surgery require anesthesia? Most surgeons will recommend the eyelid surgery be performed under a local or general anesthesia. This minimizes the pain and discomfort during the procedure. If combined with other surgeries or procedures, a general anesthesia will mostly be required. 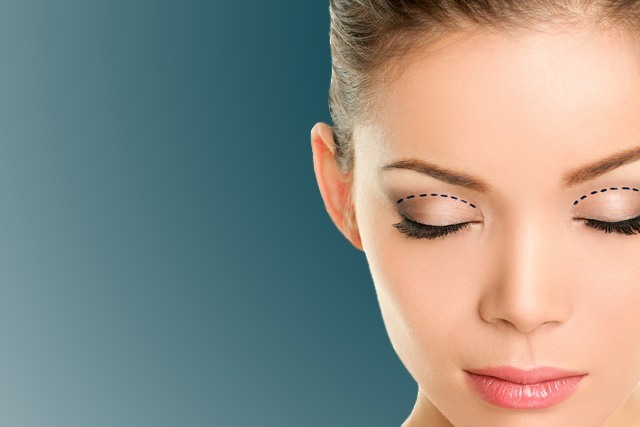 How long does an eyelid surgery take? In most cases, eyelid surgery can be performed between one and two hours, depending on the anesthesia, eyelid shape, and other factors. Are the results from an eyelid surgery immediately visible? Yes. The results of the eyelid surgery should be visible after the procedure but will be more clear after the swelling and bruising has gone down.